From the team who brought you HARD OPS and BOXCUTTER..
Hey there– You found us! You're obviously PAYING attention and you've certainly seen..
By NOW, You've seen the IMAGES. Can take HOURS to model! But in 1/10th the Time? So, What is KIT OPS ? KIT OPS has both a FREE and a PRO Blender addon that work in the current released version of Blender, which is 2.79. It uses the systemized application of .blender files, called KIT OPS INSERTS, to instantly cut and add to existing objects or create standalone objects with the goal of rapidly creating and exploring new designs. What's the difference between KIT OPS, Hard Ops and Boxcutter? They all seem to make the same type of objects. When used properly, KIT OPS can create objects and scenes with extreme efficiency and speed. Doors and windows can be inserted and cut through walls. Complex industrial designs can be generated in a single sitting. 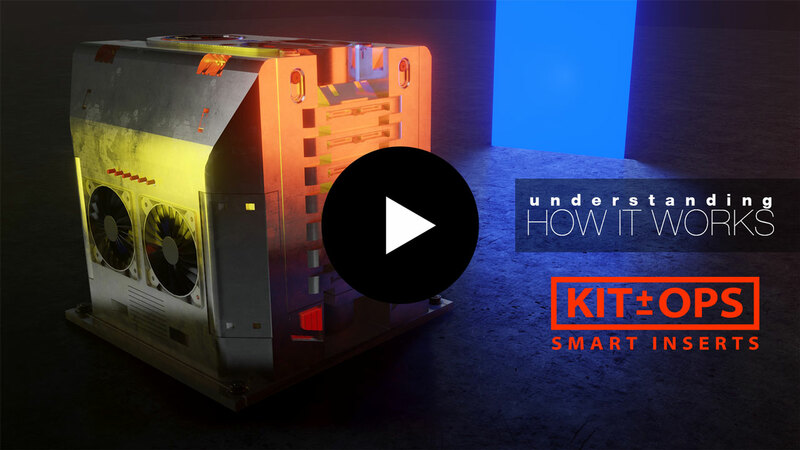 KIT OPS uses the power of the Blender Modifiers to accomplish all of this. KIT OPS comes with it's own manual, and a set of basic INSERTS you can use. Future INSERT libraries, called KPACKS*, will be forthcoming and will include architectural items (windows, doors, furniture) as well as control panels, screen graphics and more. Stay tuned! * KPACKS are simply folders of specially configured .blend INSERT files. Create and Edit INSERTS using KIT OPS PRO. The first dynamic insert system with full modifier control, and it's FREE! Using KIT OPS, it's a short task to create and design unique and compelling forms using Blender's amazing modifer stack. Just drag and drop INSERTS directly on your object to cut out new shapes and add form details. Using KIT OPS, you can build your models using SMART mode, which allows you to interactively scale, mirror, duplicate and repeat any of your INSERTS. Plus, when you're finished, you can go back and adjust the position, rotation and scale of them as well. If they are used as part of a mirror operation (available in KIT OPS PRO), their mirrored counterpart will also be transformed as well. Start Simple, add large INSERTS, then medium ones and finish using detailed INSERTS. The INSERTS are labeled and sorted into KPACKS, so you can start using large simple cutters and work your way to medium cutters and/or object INSERTS. Rotate and scale them as you like. Lastly, you can add more detailed small objects to finish and provide the final level of detail you're looking for. And, What is KIT OPS PRO ? KIT OPS PRO allows you to use many advanced placement and editing features for INSERTS while using the KITOPS CREATE panel. You can MIRROR, SHIFT+D DUPLICATE, SHIFT+R REPEAT DUPLICATE, APPLY ALL MODIFIERS, SNAP ALIGN and lots more. KIT OPS PRO is also the tool which you use to create your own custom INSERTS. It automatically knows to create the KITOPS FACTORY panel automatically when it senses you are about to edit an INSERT. There, you can assign all the necessary KIT OPS properties so it can be used in your own KIT OPS KPACKs. With KIT OPS Pro, you are free to give away or sell your own KPACKs of INSERTS. With KIT OPS PRO you can create KPACKs ranging from architectural INSERTS (doors, windows, steps, furniture, and more) to sci-fi corridor INSERTS. 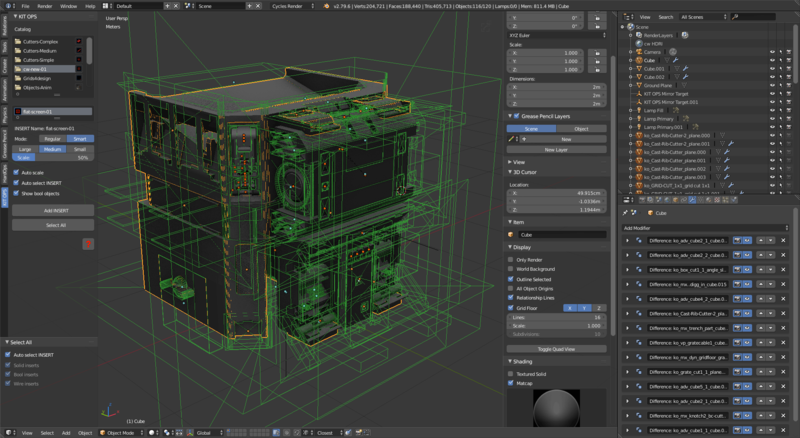 If you're interested in finding out more about KIT OPS, you should READ THE STORY or you can visit the KIT OPS thread on Blender.org.